Aisha Jordan, Ilana Warner, and Gabriel Gonzalez-Parent in Catalyst. Photo by Beth Mattison. BOTTOM LINE: Catalyst is a unique theater experience that demands we consider the ways in which we recreate our own systems of oppression. “The life of man,” Hobbes famously wrote in his political text Leviathan, “is solitary, poor, nasty, brutish, and short.” In Catalyst, a production of the social justice theater ensemble 2050 Legacy, the fundamental quality of the human spirit is explored, engaging with Hobbes’ pessimistic understanding of life. Pre-show, the sound of a heavy rainstorm fills the theater, through which six seemingly unrelated characters make their frenzied entrances, eventually finding themselves gathered together in the suspiciously well-stocked luxury bomb shelter of the perky Catherine (Michelle Perez or Liz Mazzei). Like a John Hughes movie gone dark, the characters each embody a different but complementary role. Nissa (Aisha Jordan) is down-to-earth but struggling with a low-paying service job despite her three degrees. Kovac (Gabriel Gonzalez-Parent) is a bit of a stoner, spending much of the early show confused and chilled out about what’s happening. Anabelle (Ilana Warner), attentive and sharp, is an activist whose immediate concerns are about getting out to help others. Zachariah (Liana Eldora or Aileen Velazquez) is as peaceful as possible in the unsure circumstances, and moves with a measured calm that helps the others. Last, Adrian (Frantz Jerome) is a mysteriously solemn and logical figure who doesn’t totally seem to fit in with the others. Over the course of their time together, we learn that they are not all there by accident, having been brought together by Catherine for desperate purposes. Interpersonal tensions build, culminating in a final dramatic moment that affects them all. Based on energy level, Catalyst almost operates like two separate shows. Scenes are strangely paced and slow, with long silent pauses that do not serve the urgency of the circumstances. Director Jana Lynne Umipig seems to have missed an opportunity to create a real sense of tension, undercutting moments of emotional height with long, tentative exchanges. It is unfortunate, because some of the show’s funny lines are lost due to awkward pacing. However, when the cast breaks into the creative and unexpected moments of lyrical storytelling, they sparkle with charm and focus. There are a number of these exciting moments, even more so in the second half of the show. As Catherine encourages the group to get to know each other, the bunker suddenly becomes a game show and all the strangers are contestants. In another poignant example, a conversation about jobs leads to a step routine and rap with the refrain “This is why I’m broke.” These moments are ushered with a light and sound cue, suggesting that these moments exist outside of time and space. They play with the audience’s expectations about the reality of the show, and are genuinely the strongest parts of the play. Catalyst believes deeply in the messages it conveys to the audience about social justice and systematic violence. The struggle—both of this show and of our world—is that there are just so many different kinds of violence. It is challenging to engage when characters address topics as wide-reaching as domestic abuse, racial injustice, police brutality, environmental conservation, and systematic inequality. Unfortunately, this means that few of the subjects get plumbed with real depth, save for those explored in the poetry, spoken word, or movement-based parts of the show. There are many beautiful moments in Catalyst, but it feels like they would be more poignant if the overall show were edited down to a more thorough piece. 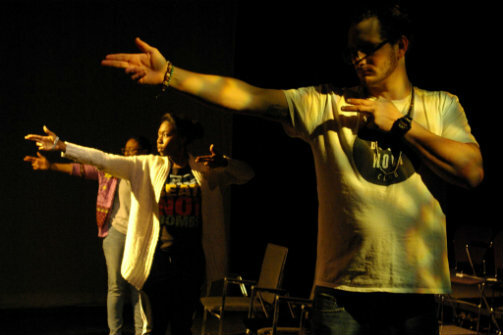 Built upon the ensemble’s personal experiences and reactions to issues of violence, Catalyst shows a group of individuals grappling with the structures of power and feelings of powerlessness. Nissa and Adrian share a lovely and real exchange about how we cannot use the master’s tools to dismantle the master’s house—a reference to the writing of Audre Lorde about black liberation and intersectional consciousness. As the world outside the bunker is washed away, the characters recognize that they must resist falling into the same patterns of oppression and hate to which they themselves have been subjected. It is, Adrian notes, “a system that keeps me hungry.” It is powerfully ambiguous, then, that the characters ultimately destroy their chance at a new utopia, beginning again the cycles of pain they seek to leave behind. Perhaps the monsters have always been inside. Catalyst ultimately leaves us with a stark mirror for us to reflect upon. Catalyst is by Aisha Jordan and Rafael Jordan. Directed by Jana Lynne Umipig. Assistant Director Rafael Jordan. Stage Manager Ashley Lopez. Co-Producers Aisha Jordan and Katie Falter. Choreography by Timothy Costa, Ilana Warner, and Denae Hannah. Sound Design by Chris Schultz. Lighting Design by Pope Jackson. Videographer/Editor is Benjamin Lundberg and Frantz Jerome. Light Board Operator is Yolanda Hoskey. The cast is Aisha Jordan, Gabriel Gonzalez-Parent, Liana Eldora, Aileen Velazquez, Ilana Warner, Liz Mazzei, Michelle Perez, Frantz Jerome, Darnell Wickham, and Jonathan Villanueva.